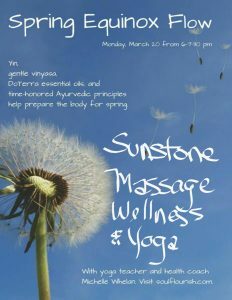 Join us on the First day of Spring with this slow mindful flow, yin yoga combined with essential oils and Ayurveda principles! A few days before we will send you a healthy cooking recipe to support the body as it transitions into spring. We suggest you prepare the meal to be eaten when you arrive home after class! Space limited, sign up soon. Reserve Your Spot Today By Paying online! THIS CLASS IS FULL. Please call for wait list.